When sprinter Usain Bolt won the gold medal in the 100-meter dash at the 2008 Olympics in Beijing, we were shocked but not surprised. Bolt's time of 9.69 was otherworldly, and he achieved it despite decelerating with at least a quarter of the race remaining, which was mind-blowing, but world-record dominance was exactly what we were expecting from the charismatic Jamaican. Technically, there were seven other entrants in the "race" that night, but we knew it would be a one-man event, and it was. At the midway point, Bolt separated himself from the field as if his opponents had been slammed by a gale-force headwind; a few meters later, Bolt glanced over his shoulder as if wondering where everyone had gone. It was a dominating performance like no other — because previously no one had run under 9.72 — and yet something about it was familiar. 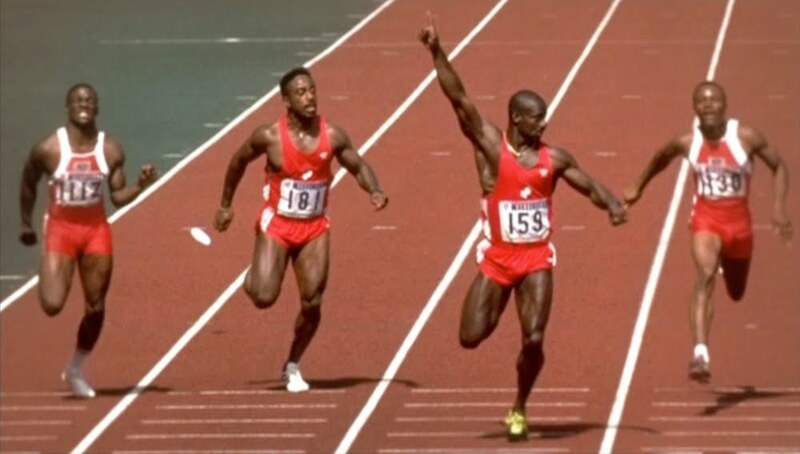 Twenty years earlier, the same event was won in similarly dominating fashion by Canadian sprinter Ben Johnson, who bested the world record by four hundredths of a second while leaving his competitors in the dust in 9.79 — a time only seven men have matched since. Bolt's victory in Beijing launched him toward superstardom, but Johnson's inspired what might be the biggest controversy in Olympics history, bringing performance enhancing drugs (PEDs) into the spotlight like never before. Daniel Gordon's documentary 9.79* rediscovers and further explores that controversy through interviews with its key players, including Johnson, runner-up turned winner Carl Lewis and the other six members of the 100-meter final that day. In memory, Johnson is the villain, the guy who tested positive for PEDs and lost his gold medal by disqualification, the guy who appeared on the cover of Sports Illustrated next to a headline reading "Busted" and the guy who eventually was banned for the sport for another failed test. But in hindsight Johnson is the guy who got caught doing what almost everyone else was doing, the guy who knowingly cheated but also might have been set up and the proverbial canary in the coalmine tipping us to a much larger problem that, in many respects, we are still too romantic or timid to confront. If the subsequent PED scandals in baseball and cycling weren't enough to make you see Johnson a bit differently, consider this: all but two of the entrants in that 1988 final wound up implicated in drug use down the road. Gordon's documentary, the latest release in ESPN Films' "30 for 30" series, doesn't apologize for Johnson's sins, nor does it praise him for his subsequent accountability, a la John Singleton's regrettable portrayal of Marion Jones in the 2010 "30 for 30" doc Press Pause. Instead, Gordon's doc makes it clear that Johnson almost certainly wasn't only cheater in that 100 final in Seoul. He was just the fastest. Given the way landmark scandals, like Johnson's positive PED test, tend to imprint themselves on the brain and skew our historical perception, we need more documentaries like this one that revisit historical events and recontextualize them, blasting away the myths of the moment — often the result of incomplete reporting or false assumptions — with retrospective wisdom and clarity. Yet for a film designed to illuminate the past, 9.79* is maddeningly murky. By the end of the film it's difficult to figure out which athletes used PEDs and when, whether Johnson sees himself as a calculating cheater or a victim or a scapegoat or some combination of the above, or what all of this suggests about track and field today, including the performances of Bolt, which seem too good to be true, much as we want to believe in them. To be fair, some of the documentary's murkiness is an unavoidable result of its narrow focus — only a Ken Burns-esque series could examine the history of PEDs in track and field alone or the trickledown implications of the Johnson scandal on athletics overall. Likewise, some of the doc's murkiness is the natural byproduct of a Rashomon-like scenario in which everyone interviewed seems to have a personal interest to protect and an axe to grind. All of that said, however, any film with a journalistic interest in clarifying the past can't be so willing to settle for ambiguity. Going off what's in the film, and more so what isn't, Gordon needed to be a more challenging interviewer. Over and over again, athletes who failed drug tests profess their innocence (at least to a point) or their ignorance, or they manage to deflect blame — usually by insisting that they were compelled to cheat in order to remain relevant within a corrupt system. For the most part, their contradictions are obvious, so it isn't necessary for Gordon to grill each subject on the inconsistencies of their personal histories. But given their reputations for duplicity and their obvious bias, Gordon had a journalistic responsibility to hold his subjects accountable when they started pointing fingers at their peers. Alas, this 79-minute documentary is dominated by former runners and others within the track community saying with a knowing smile that "everybody knew" who was cheating back then without actually naming names. This kind of disingenuous straight-talk posturing, in which sly innuendo is passed off as dignified restraint, when really it's passive-aggressive gutlessness, may be fashionable on Twitter, but in a documentary in which athletes' reputations are on the line it's insufficient, and Gordon's willingness to let his subjects imply wrongdoing without committing themselves to an actual allegation is irresponsible. As a result of Gordon's approach, the biggest loser in 9.79* isn't Johnson, who had no reputation left to protect, but Lewis, the guy who won the race by finishing second and passing his drug test. Winner of nine gold medals over four Olympics, Lewis avoided any official drug infractions during his distinguished career, but he could never entirely outrun rumors within the track community, even if his taller, thinner frame and consistent excellence didn't inspire as much suspicion as Johnson's shorter, bulkier body and meteoric rise. Throughout the documentary, several talking-heads take veiled potshots at Lewis, and, in effect, Gordon does, too, following up a medical expert's comment that athletes using human growth hormone sometimes need to wear orthodontic braces, to counteract the effects of an elongating jaw, with a shot of Lewis in an ear-to-ear, braces-revealing smile — as if Lewis' braces couldn't be evidence of his image consciousness or unmistakable vanity. Yet despite the frequency of these open-and-shut insinuations, almost no one has the balls to come right out and call Lewis a cheater, and it appears that Gordon didn't have enough guts to challenge the legendary sprinter on the widespread rumors. (Lewis is asked about a specific drug test, but the bulk of the documentary's wink-wink allegations are never put on the table for Lewis to refute.) We tend to think of "gotcha" journalism as setting up a subject for a self-implicating response, but allowing Lewis' peers to destroy his reputation behind his back without challenging them on their allusions or providing Lewis with the chance to respond is equally underhanded. Of course, it's obvious what Lewis' response would have been if asked if he used PEDs: he'd have claimed his innocence, as he has done repeatedly over the years. So, yeah, if you think it's highly probable that Lewis used PEDs, there's poetic justice to be found in watching other sprinters trash a guy who was quick to use his fame and popularity to point an unspecific finger at his competition during his career (once he couldn't beat them, at least), and who conveniently can't remember anything about the 1988 final, when he stepped out of his lane while looking at Johnson, which should have led to his disqualification. Still, the Lewis PED rumors needed to be met head-on, and in its evasiveness 9.79* does as much to reveal our current attitude about PEDs as it does to shine a light on the past. After so many scandals, we're less naive than we used to be and more cynical, and when athletes are busted we might be momentarily shocked but at the same time we're never surprised. But as comfortable as we have become disparaging those who get busted, we still seem to be reluctant to face the entire unvarnished, unpleasant truth, or at least we're uncomfortable with asking the questions that would get us there. 9.79* leaves no doubt that Johnson was one of many, not an outlier, and there's some honor in that. But dismissing one fiction by fanning the flames of hearsay isn't the same thing as uncovering the truth. 9.79* premieres tonight on ESPN at 8 pm ET, and will rerun frequently thereafter. The Cooler hopes to review each new film in the "30 for 30" series upon its release. Very cool, Jason. I'm glad you write about sports pieces in addition to your regular reviews. Did you review James Toback's "Tyson" when it came out? Man, I just read this again - very cool essay. You think there's gonna probably be an even more tip-toey, finger-pointy version of this about Lance getting all his Tour medals taken back? Guh, that's gonna be hard to watch on many levels. Does this doc get into any peripheral discussion about which PED's are destined to become legal and commonplace? And in an unrelated note, are you going to see The Paperboy and review it?